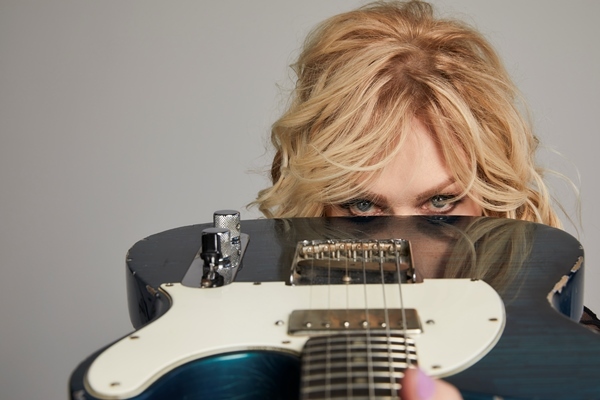 Nancy Wilson has spent pretty much her entire adult life as the guitarist (and sometime singer) of arguably the most respected female-led rock band of the last 40 years. Nancy joined her older sister Ann Wilson’s band when she was a mere 16 years old. That band turned into Heart, which was one of the superstar acts of the 70s through the 90s, spawning huge hit singles, multi-platinum albums and even entrance into the Rock and Roll Hall of Fame. 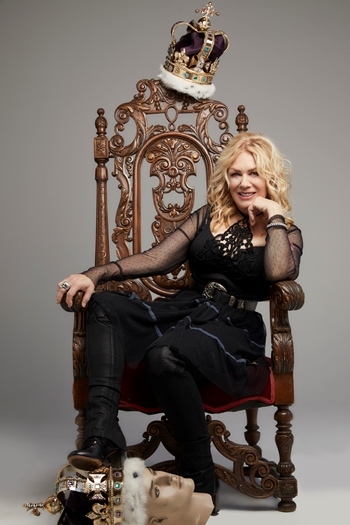 Nancy Wilson co-wrote many of the band’s classics has played the axe for the band for the band’s entire run of over 40 years. She even sang lead vocals on some songs like “These Dreams,” “Treat Me Well,” “There’s the Girl” and “Will You Be There in the Morning,” though since sister Ann is widely considered one of the best rock voices in the world, Nancy mostly left the lead vocals to her. 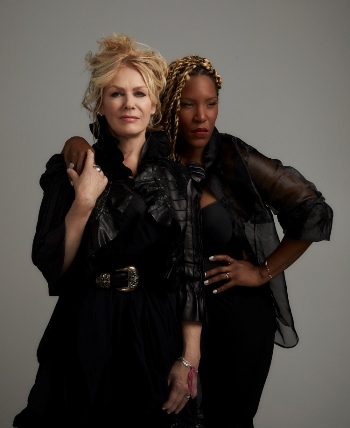 While the Wilson sisters have temporarily done side projects over the years – like the sister group the Lovemongers in the 1990s, Ann’s solo work and Nancy’s film scoring work – for the most part Heart has been Nancy’s musical life. The first fruits of Nancy Wilson’s efforts have finally arrived. She has formed a new band called Roadcase Royale with co-lead singer Liv Warfield, a former member of Prince’s backing band The New Power Generation. The band also features Heart members Dan Rothchild (who also produced their debut album), Chris Joyner and Ben Smith, as well as Warfield’s longtime musical partner Ryan Waters. 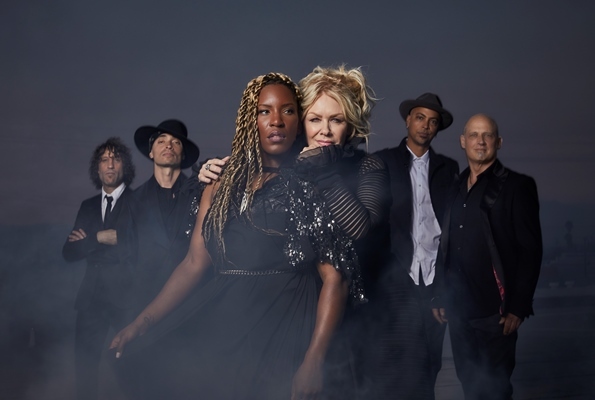 Right before Roadcase Royale’s debut album First Things First was released, I sat down with Nancy Wilson to discuss her career and her new band. I know that you and Ann formed the Lovemongers in the 1990s, but essentially you have been playing with one band your whole career. What is it like to start out with a whole new band after devoting over 40 years to Heart? It’s a little bit scary, but sometimes scary is good, because it represents forward motion and changes. Breaking out of habits and old molds that you might have been stuck in. Old attitudes. In this case, with Roadcase Royale, because of who they are, how we all get along, and how we all contribute artistically as songwriters, producers and arrangers to the project, it’s really an amazing sense of freedom. I’ve now started to enjoy working with these people, because they all bring so much to the table. I don’t feel like I have to be stuck in my lane, you know? It’s like we’ve widened the freeway as a band. We’ve made a big freeway together. Everybody can switch lanes freely. Everybody’s very excited and up. I like to say this is the honeymoon of this band. We were just opening for Bob Seger for almost a month, and then it sort of disappeared on us because Bob Seger had a couple of back issues. We’ll get back out there, obviously, but we were like “Oh my God, we had such momentum.” We were really killing it. Have you heard how Seger is doing and about when you may be able to get back on the road? How did you hook up with Liv Warfield, and what was it about her that you felt would be a good fit to form a band? She was in a band a while back called BlackBird. Somebody told us, “You’ve got to check out this amazing singer.” She sang with the Roots on Jimmy Fallon [The Tonight Show]. We found it. We tuned in. We saw her do this amazing song that [was from] when Prince was mentoring her. She was just completely authentic, as a singer, as a powerful presence. We were floored. We were at the same time looking for an opening act for Heart, to open for us at the Hollywood Bowl for a couple of nights. We asked Liv Warfield, and they said yes, so that was when we started to be able to hang out a little bit and talk. She was watching our show and we were watching her show. It was just like, wow. She caught up to me one night before I was leaving, and she said, “I think your rock band is so great. Such a great rock band. I want to rock more like y’all. Sometimes I feel a little stuck in the R&B perception. I really want to rock more. Could I send you some of my material?” She works always with Ryan Waters, who has been her musical partner for years. I said absolutely, send me what you’ve got. As soon as I started listening to what she was trying to develop, towards rock, with her amazing voice and her guitar player, Ryan, I was really impressed. I said we should definitely get together and talk some more about what we could do. About doing some songs together. Were there any musical styles or ideas that you have been able to explore with Roadcase Royale that may not have felt comfortable with Heart? For example, the new version of “Even it Up” you do seems a little funkier to me than the original. I did not feel confined inside of Heart, stylistically, because Heart is a very versatile band, too. We did funky stuff, and often we did crazy, off-the-charts stuff, and we did a lot of more traditional, almost classical rock. We had some big theater, and we also had humor in Heart. So, I never felt like I was stuck in a lane. The only way I think anybody ends up feeling stuck in a lane is for a good reason, you have hit songs that people really want to hear over and over. (laughs) That’s a good problem. And those are really good songs, too. In the case of “Even it Up,” that was an acoustic jam at the beginning. That was a jam I had. I was going to find a song that it could be an acoustic intro in front, kind of like the “Silver Wheels” song is in front of “Crazy on You.” It turned into an acoustic jam, which then me and Ann and our friend Sue Ennis that we write with and wrote with quite a bit, we just really got into the jam so much that it became “Even it Up.” Then we added a horn section and everything else. Now, with Roadcase Royale, that’s the acoustic jam version again. I come out on stage and I jam with myself acoustically on “Even it Up” for quite a while before I start singing it. It’s kind of a cool intro to the show. While you always sang some lead vocals with Heart, you mostly left that to Ann. Is it fun to take a more active role in singing lead? I didn’t get a breakdown, but it seemed from listening like you and Liv shared leads pretty evenly. Oh, yeah. I always loved singing, but I felt a little more intimidated as a lead singer just standing next to somebody as great of a singer as Ann Wilson is. In the case of this band, Roadcase Royale, Liv was like, “You have a really good voice. You should sing more. Sing more.” And I’m like: well, okay… (laughs) But trying to sing more was really fun. Singing “Even it Up” is in a good range for me. A lot of Heart songs I couldn’t sing, because it is way out of my range. I’m just kind of a regular, very okay singer, but people like Liv, they are range-less. They can go anywhere they want. Like most singers, there is a cap on what I can do well. That’s okay, because it’s just fun to sing that way, too. In the case of “These Dreams,” I wanted to share some of the parts that were a little more difficult for me, in the bridge section, for instance. Trade it off with Liv. I really ended up loving this brand-new version of it. First Things First has some fantastic songs on there, things like “Hold on to My Hand,” “Get Loud,” “The Dragon,” and “Cover Each Other.” Were there any songs on the album that you were especially excited to get out there, or that you are particularly fond of? Right now, we’re still in this honeymoon phase. (laughs) Everything is new and fun. As far as getting that song “The Dragon” finally finished, I started it back in the 90s with all the Seattle groups we came to know. [ed. note: The song is loosely based on late Alice in Chains leader Layne Staley.] We went home after the 80s for a while. That song was never quite finished. It was never destined to be a Heart song. We tried it a few times, it just never gelled. Somebody reminded me of it – my hairdresser Tommy. He said, “What about that song ‘The Dragon?’ You should put that on your new album.” So, I got one of the guys, Dan [Rothchild], to help me finish it. It worked out perfect for the album. It’s interesting as a songwriter to cover each other. With one of the songs I had these lyrics, the guys had this jam, and then Liv came up with these melodies. That song just like kind of dropped out of the sky. A song like “The Dragon,” it took a couple of decades to finish. (laughs again) You never know. You never know where it all is going to come from. I didn’t see writing credits in the CD booklet. Was that the way it normally went? Did you write songs together, did you get the whole band involved, or did you write your own songs? Except for “Even it Up” and “These Dreams,” we consider all the new stuff as Roadcase Royale songs. Everyone contributed in some way to each of the new songs. The way we do the song splits is more the main contributors get the 50% and everyone else, whether or not they contributed, gets equal division of the second 50%. The lawyers are like, “What are you doing? You’re not supposed to do that!” (laughs) But that’s how it feels inside the band. Everyone’s been around. Everyone is really experienced, as players, as songwriters, as producers, performers. We all bring a big share to it, so we’re cutting our own new trail. I read an interview with Dan Rothchild where he was discussing how he grew up loving Heart and learning all your music. All these years later, he has been with Heart for a few years, and now with Roadcase Royale and he also produced the album. What is he like to work with and what does he bring to the group? Me and Dan have been working in tandem quite a bit for the last couple of Heart albums, especially Beautiful Broken. It’s great to have this beautiful new band where he’s doing the production, but it’s produced by Dan Rothchild and Roadcase Royale, because we all contribute, similarly. But, Dan is the one who takes it home, stays up all night, and comps vocals at home. [He] saves money by not staying in the studio, working all night long. There is a way that he brings so much of the great housekeeping-type busy work to the project that saves us a lot of money. I know you have just released a video for “Cover Each Other,” but the musical landscape these days is so different from when you were coming up with Heart. Do you still think in terms of hit singles? You did re-record a couple of your old Heart songs for the album as well – “Even it Up,” as we discussed before, and “These Dreams.” Why did you want to revisit those songs? It was a wise decision to listen to Tom Lipsky, at the Loud and Proud record label that signed us, that if we have a couple of Heart songs on our record, it will be like a connective tissue that brings Heart fans to our new band. Finding any way of being noticed anymore is really difficult. If there is something familiar to help Roadcase Royale, to put us on the map… The same with playing the Bob Seger shows. We’re doing half Heart songs and half Roadcase Royale songs in a 45-minute set. By the end of our set, when we do “Crazy on You,” the whole place was full and standing, so I thought it was a really good concept. At first, I resisted: I want to do something completely new and completely original. Then, when we reinterpreted those Heart songs, actually now what we’re doing are my favorite versions. [“These Dreams”] takes a lot of the 80s production – the banks and banks of keyboards and percussion loops – out of it. It just makes it a regular harmony song. It’s such a beautiful song to begin with. The context of this version of it is the most honest of any version we’ve probably done. I was so sorry to hear about [long-time Heart manager] Carol Peters passing. How instrumental do you think that she was for your having such a long career as a musician? She was highly instrumental in our longevity. She took us on at a time that any other rock band’s lifespan – or second or third lifespan – was probably over. She sat down with us and she said, “What is your bucket list? What do you want to see happen in the next two years? What would you dream? What would be your favorite scenario? Your wish list for the next two years?” It was like, well… another album. Another tour. Doing things outside of just the album and tour. I was going to do a children’s book, and maybe work on some film scores, which I did. It was a wonderful thing to have this woman who sort of became our Jewish mother. (laughs) She was a real ball of fire. A big ball of fire in a very small package, really. She gave us a lot of renewed energy to go ahead and fight against some of the more negative perceptions for women, especially after the 80s, when you had to look perfect. You couldn’t just be good, you had to look good. That was more important at many times. More than the music was the perception and the imaging of it all. We were fighting against that with a really ferocious woman who was fighting for our women’s rights, in a way, inside the industry. What was it like as a very young musician when the band suddenly exploded with “Magic Man” and the Dreamboat Annie album, which had been around for a while, just exploded? How surreal was it suddenly being all over radio and television? I know there have been some problems, and you and Ann are currently taking some time to concentrate on your own music. Do you think the two of you will get back together as Heart – or even as a different band like The Lovemongers – in the future? It’s hard to say right now. I’m still consumed and excited by Roadcase Royale right now. And I know that Ann is still doing her own thing, so I don’t know where the future of Heart might fall. I don’t see it anytime soon, just because we’re both consumed with our other side projects. That might be the healthiest thing, for Heart to just be nowhere for a while. (laughs) I think if me and Ann ever came back together musically, it might be on some completely different kind of project. Something really different from Heart. Photos by Jeremy Danger © 2017. Courtesy of Loud and Proud Records and Miles High Productions. Tags: Alice in Chains, Ann Wilson, Beautiful Broken, Ben Smith, Blackbird, bob seger, Carol Peters, Chris Joyner, Cover Each Other, Crazy On You, Dan Rothchild, Dreamboat Annie, Even it Up, Get Loud, Heart, Hold on to My Hand, Jay S. Jacobs, Jimmy Fallon, Layne Staley, Liv Warfield, Magic Man, Nancy Wilson, New Power Generation, prince, Roadcase Royale, Rock and Roll Hall of Fame, Ryan Waters, Silver Wheels, Sue Ennis, The Dragon, The Lovemongers, the roots, The Tonight Show, There’s the Girl, These Dreams, Treat Me Well, Will You Be There in the Morning?. Bookmark the permalink.